Oh, Molly – 365, 115, originally uploaded by Fluttering By. I’ve been really committing myself lately to be taking intentional photographs. Most of the time I get take a couple shots and one or two end up well, but today I was surprised just how well this one ended up. And I mean that in the way that there was only one shot I took. 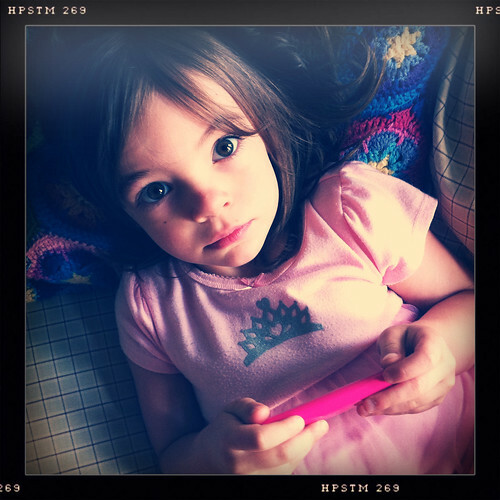 I hovered over Molly as she was playing "Teach me preschool" on her iPod Touch, made sure I was in a good spot for the natural light, focused, and then said, "Oh, Molly." Snap. (in Hipstamatic) and that was that.